Sanctuary, with its chandeliers and vaguely gothic ambiance - protected by gargoyles like the sanctuaries of Europe - is elegant, yet comfortable. 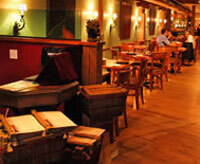 It is meant to be a haven where food, service and music please the senses. A fireplace warms cold nights - a patio with flowers and herbs celebrates summer. With thick limestone, rough timbers and ceiling beams dating back to the 1860's, it reminds you of that small romantic place you'd love to visit again. Sanctuary serves New American Cuisine, deftly combining immigrant influences from the Mediterranean to Japan into dishes that are delicious, amazing and satisfying. The menu stays enticing with weekday Tasting Menus, special creations Fri./Sat. and menu changes every other month. The StarTribune said, “[I] loved the well-paired wines, the genial service, the cozy surroundings and the kitchen's finesse." 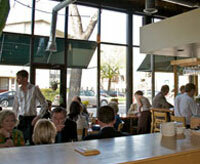 Located one block from the Guthrie, it is the perfect place for dinner before or after a show. Spill the Wine is located on 11th and Washington Ave S in the Theatre District. We feature two separate spaces, one as the dining room with an open kitchen. The other side features a lounge with full menu, televisions, oak handcrafted bar top and a wall displayed with regional wine. 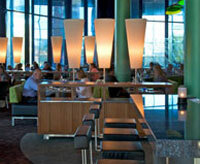 The menu highlights American Cuisine with continental influences. 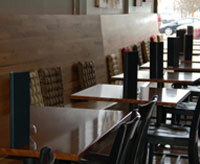 Spill the Wine is open for lunch, dinner and Sunday brunch. Enjoy a particular glass of wine? Great – stop into the Wine Boutique to pick up a bottle to take home with you. Spill the Wine carries over 100 wines in the boutique to cater to your wine collection at home. Parking is available in the rear of the building as well as parking meters around the perimeter of the restaurant. Valet is available during dome events on the weekends. Spill the Wine will host your next company party, celebration, or wine tasting in our private lounge space or will close out the restaurant. 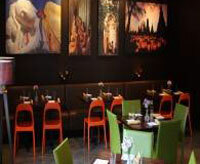 Kindee offers traditional Thai cuisine with a modern flair. Our menu offers a large variety of unique appetizers, delicious entrées, hot soups and crisp salads. Whatever your preference, we are sure you will find something on our menu that will satisfy your appetite. Located in the heart of the Mill District, across the street from the Guthrie Theater, Kindee has proven to be a mainstay of the diverse culinary culture of downtown Minneapolis. Whether you are in Minneapolis on business, for a show at the Guthrie, or are just looking for a great Thai meal with friends or family, Kindee is happy to accommodate. Renowned Chef Tim McKee, 2009 James Beard award winner for “Best Chef Midwest”, designed the core menu for Sea Change which focuses on sustainable seafood, highlighting fisheries that use environmentally responsible methods of gathering and farming seafood. The menu also includes a number of items under the heading “Not Fish” as well as late night offerings of small plates and raw bar selections.